1.3 Import K2 and Compojoom comment. 2.3 Character counter in comment form. K2, Easyblog and JoomBlog integration options by default. 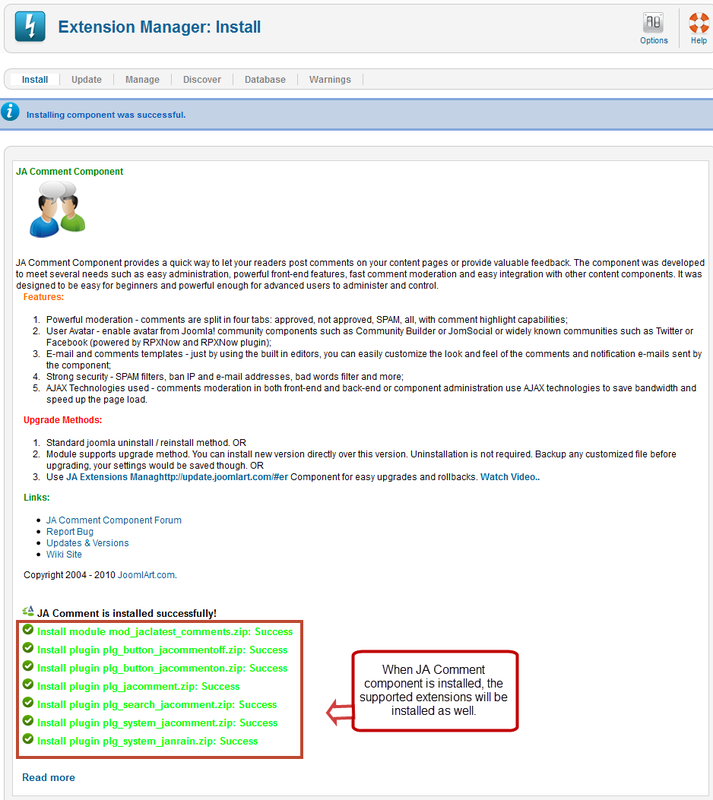 Once your site have the following components: K2, Easyblog and JoomBlog, you can select to enable JA Comment on the component by selecting the component in the configuration panel of JA Comment content plugin. Go to: Extensions --> Plugin Manager --> open plugin: Content - JA Comment. Note: if you select "ALL", JA comment will be enabled in all the components. API available for 3rd party developers to develop integration plugins. 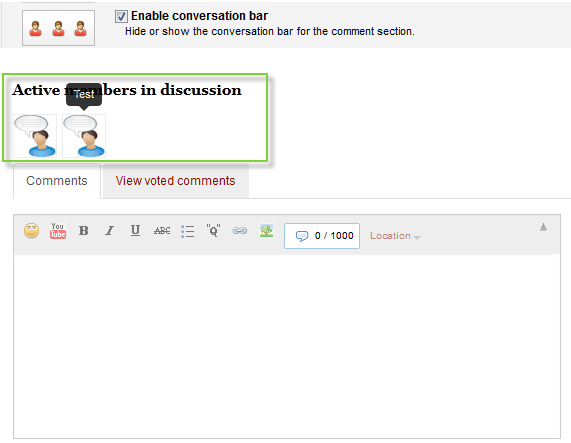 This is the solution for the content that JA Comment does not support but can still have JA Comment form enabled in. From version 2.5.1, it is easy for 3rd party developers to develop integration plugins. 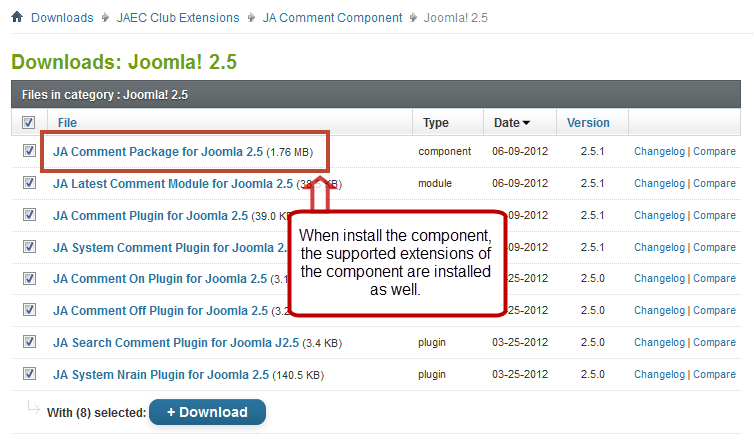 If your content is not supported by JA Comment as default (JA Comment support: Joomla content, K2 Component, Easyblog component, Compojoom Component, and Joomblog), you can define to display JA Comment form in the content. 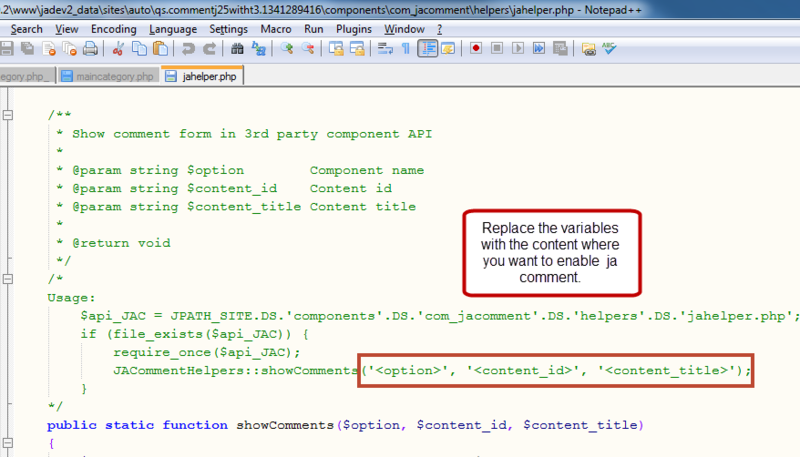 Go to: Your_site\components\com_jacomment\helpers, you will see the jahelper.php file, you need to add content info in this file to enable JA Comment form in the content. You need to enable the code and replace the highlighted options with the content info that you want to display JA Comment form in. <content_tile> = title of your content. Import from K2 comment and Compojoom comment component. 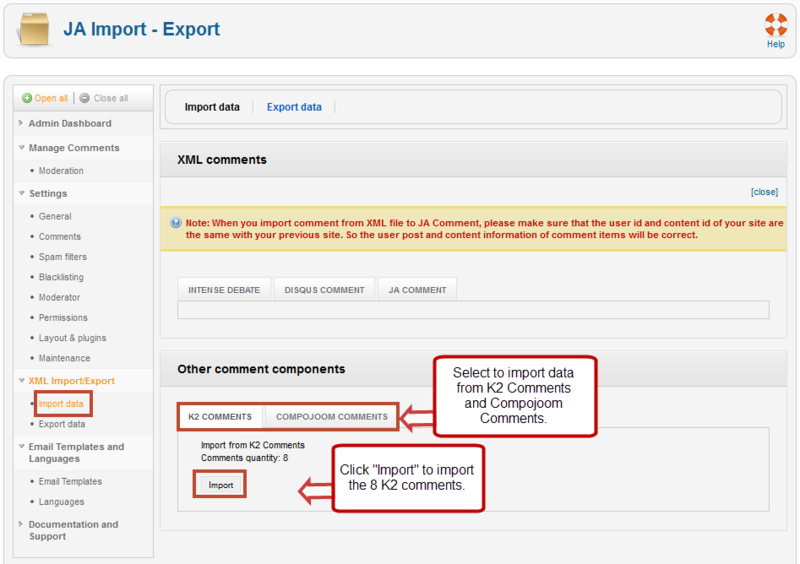 From version 2.5.1, you can import data from K2 Comments and Compojoom Comment component to JA Comment. 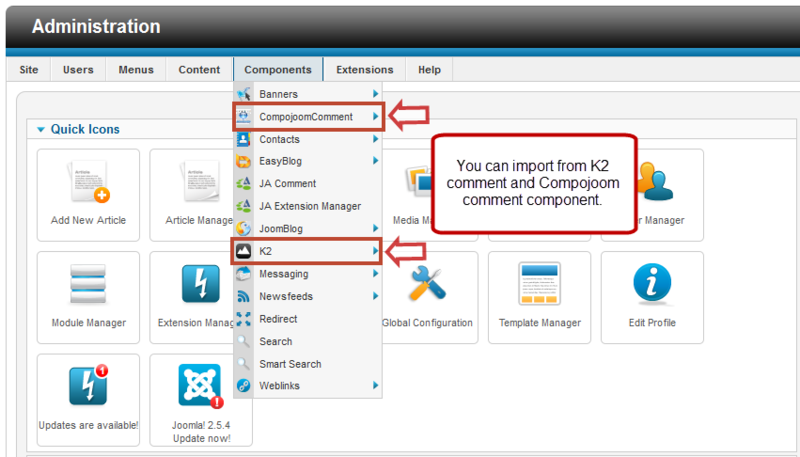 Select to import data from K2 Comments and Compojoom Comments component. Once done, the K2 comments and Compojoom comments will be displayed as a JA Comment. 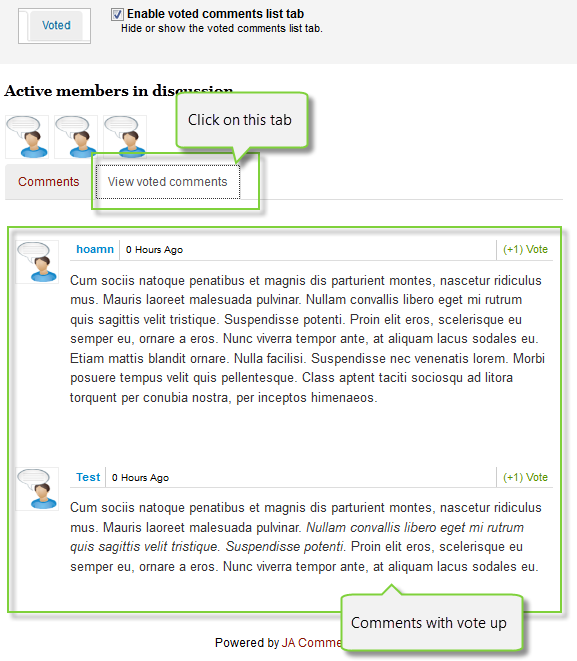 As you know, there are many extensions go with JA Comment component like: Ja comment plugin, JA System Comment Plugin ... Now, you don't need to install them one by one. We support single package installation, you just need to install the JA Comment component, one the component is installed, all the supported extensions for the component are installed as well. Show voted comment list in tab. Show List of comment authors in conversation. Note: Avatar is shown based on Avatar settings in backend. Character counter in comment form. 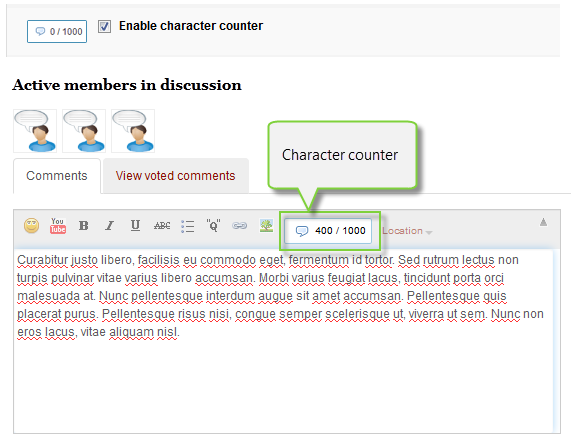 Each time when you put comment in the text-box, counter shows the number character in your comment, if number count is exceeded, no character can be added. To enable this feature, go to Back-end >> Components >> JA Comment >> Layout & Plugin-in >> Plugin >> Find Enable character counter. Note: Setting for minimum and maximum character is in Spam Filter tab. Comment author location (use Google Map API). 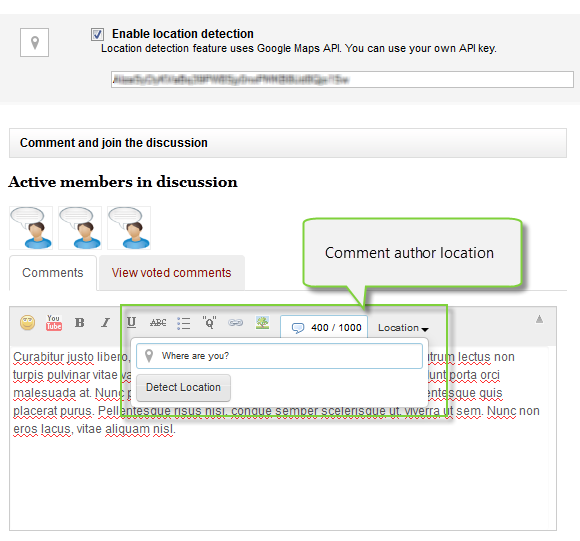 With Comment author location feature, user can show where they are. User can type location by themselves or auto detect by Google May API. You can use your own API key, if you are new, see our instruction of Get Google API To enable this feature, go to Back-end >> Components >> JA Comment >> Layout & Plugin-in >> Plugin >> Find Enable location detection.